The Ministry of Agriculture needs to pay more attention to the plight of our farmers. Our famers have suffered more than enough in the hands of the two previous governments and therefore this government should not allow their suffering to continue any further. Reports reaching the Daily newspaper indicate that there are farmers who have not been paid for their produce; while others were only given cheques to be cashed in the Banjul areas. Imagine a farmer from Niamina Dankunku to be given a cheque for fifty thousand for groundnut sold at the nearest buying point in his village to travel all the way to Banjul in order to get his money. This is not fair with the farmers as they will have to pay extra cost in terms of transport fares accommodation and feeding; which cost would not be covered by those who bought their peanuts. Government or particularly the Ministry of Agriculture needs to put in a place a system where farmers are paid at the buying points. It is disheartening to note that some of our farmers are still without their monies. The farmer works for more than six months before he or she is able to make his produce available for sale; and the six months is very labour intensive. Therefore, it is only fair that such a person is paid on the spot without any delay. What will happen if a civil servant is not paid for even more than three weeks after the month ends? The ministry should look into this and make sure farmers who are still owed by buying agents pay them their monies immediately. We should remember that farming a is business and if we want the farmers to stay on their farms and produce, there must be incentives and the best incentive for the farmer is giving him or her good price, provide a good market and in some cases storage facilities be provided. The ministry should think of invigorating a cooperative union for farmers; the Gambia Cooperative Union used to be responsible of buying famers produce ranging from paddy rice, groundnuts and even animals. And in those days farmers were paid on the spot for whatever farm produce placed on the scales. Yes there were credit buying but such was just for a number of few days; from 1980s up to the time the Gambia Cooperative Union was closed there were no credit buying. Farmers got paid on the spot and buying points were all over the country for easy access by farmers. And it did not only stop at buying farmers produce on the spot but also farmers were given loans including fertilizers and seednuts by the union. What is stopping the Ministry of Agriculture bringing back the Gambia Cooperative Union? As a government in transition such should have been their topmost priority so that the missing links in the immediate past government are put in place. 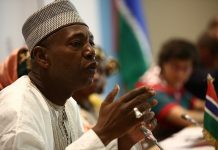 The current Minister of Agriculture was himself a former employee of the Gambia Cooperative Union, so why the delay? The situation of the agricultural sector is not desirable at all; farmers are not happy with the way their produces are handled by buyers. Some of them still could not have good access roads to their farms in the Salums, Niaminas just to name a few and this situation almost cut across the country. The Jahally Pacharr Rice field if properly managed can feed the Gambia but this field is deteriorating on a daily basis with the farmers among those who are most dissatisfied. The Gambia government needs to act now otherwise yesterday will be considered better than today.